The idea of leaving the boat for a week was to give us time to get home and sort out our respective businesses before coming back for another week’s cruising. I don’t know, weeks just aren’t as long as they used to be – that must be the only explanation for the frantic pace we had to set to get all our chores done in the time available. Of course, this wasn’t helped by my spending at least half a day in total ferrying Lou to the vet and physiotherapist – she’d pulled a muscle in her thigh, tweaked the muscle that runs along one flank and hurt her neck and was in screaming pain on the Monday (she was much better by the weekend but has since had a relapse). It all worked out in the end – I did manage to get my shed (it’s a very nice shed!) to a habitable state for cousin Denise and family – who were using our place as a base for their holiday. Unfortunately the house was a state, but she promised not to look so we closed the door on the mess and came north. We decided to leave Ty with Richard’s mum this week – he really loves it at her house and he’s not taxed by having to leave the confines of the garden – bliss! 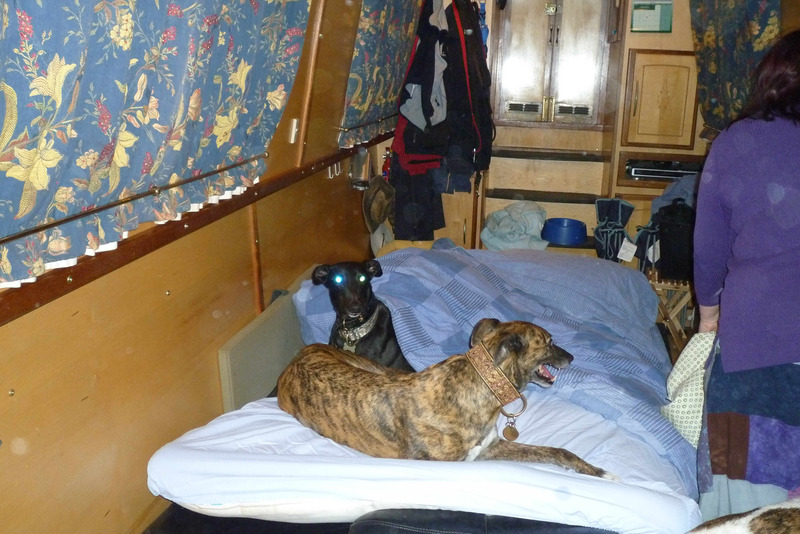 We took Lou and Lynx with us – we had considered leaving Lou behind as well but the physiotherapist thought that clambering up the boat steps would do less damage then charging around Richard’s mum’s garden! This time we tried a variation on a theme and went anti-clockwise along the M25 as we needed to visit Greyhoundhomer to drop off some home-made jam (Pat who runs the charity is a demon jam-seller!). Needless to say we got stuck in a tedious hour-long queue, though Pat’s hospitality – for humans and hounds – made the world a better place. To make things more interesting, we also encountered queues on the M11 – we’ve not been stuck there before – always nice to ring the changes! At least the A1 was running well…. 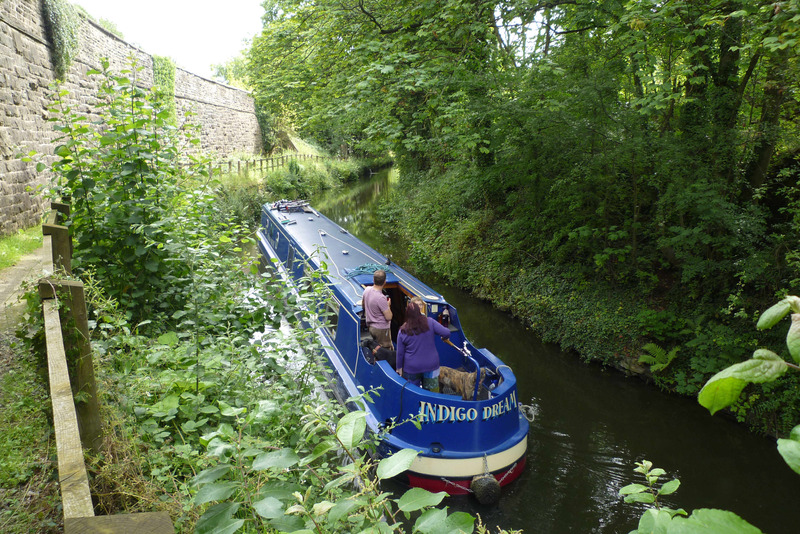 We got to the boat by 8.30pm – there’s convenient parking by Kiveton Park train station. We quickly packed dogs and provisions on board. The boat had been fine on the moorings – it’s such a quiet spot. We’d left the power on while we away so that we could run the fridge – we couldn’t bring ourselves to throw away the supply of ice-cream left over in the freezer after our last cruise! The batteries had coped very well – they were at 49%. There was a boat on the moorings behind us – I didn’t catch the name – but they were very friendly folk and obligingly let us run the engine for an hour after hours just to give the batteries a quick boost. We were weary after a 4-hour drive but forced ourselves to go further afield to eat and to find a shop for the basics. 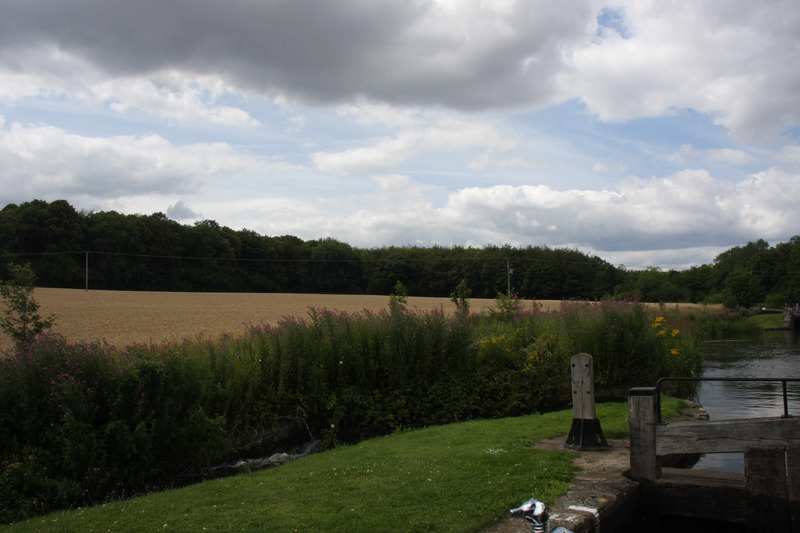 There are useful facilities at Gateford, just outside Worksop – we stopped off at a complex which included a huge Asda, small Tesco Local, sundry other shops and the “Romans Rest” pub. We had a sound meal at the pub and topped up with basic provisions at the Tesco local – that left us with a smaller shop to do before our guests arrived on Saturday morning…..
We were up early in order to get ready for our guests – friend Matthew (who has been before) and his 10-year old son Daniel. Daniel wants to be a vet when he grows up and is desperate to own a dog (he has a cat) and is obsessed with greyhounds. I can honestly say that Lou and Lynx have never been more loved – they ‘endured’ cuddles all day long – Daniel being very solicitous of Lou’s aches and pains. Typically Lynx resisted all of Daniel’s efforts at dog training! Luckily, we’d given the boat a good clean before we left her last week so that was one less morning chore. Richard went off to get some fresh pastries and hot chicken for the hounds (there’s also a mega-Tesco near Gateford) and I mooched round generally getting ready for the day. The boat moored behind us had moved on early so we had the prospect of the locks being set against us all the way down. On the bright side, I know that Matthew has been having a fitness campaign recently so he’d soon get us down the flight! 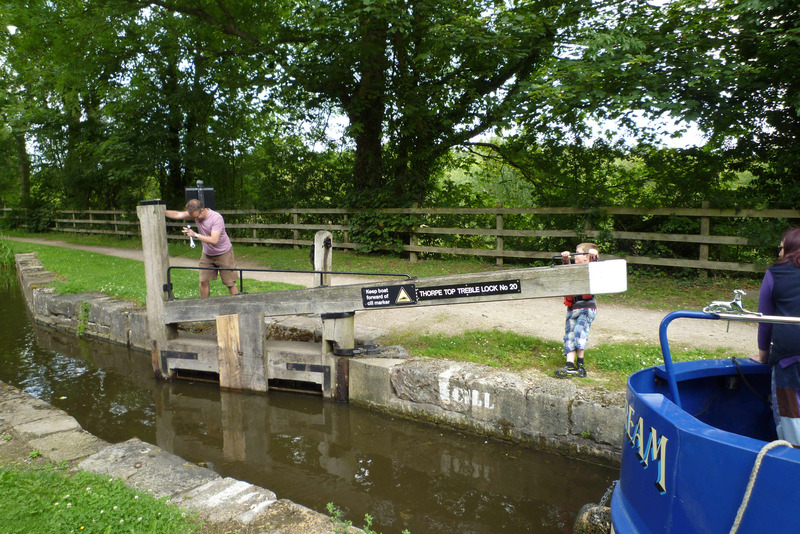 Our guests arrived in good time and did the morning car shuffle – it didn’t take very long as we’d only be moving 3 or 4 linear miles but packing in 30-odd locks. 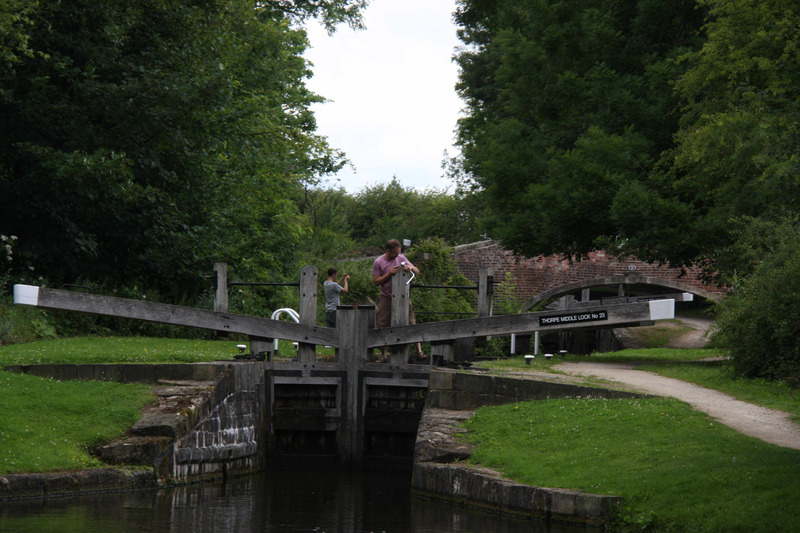 Matthew and Daniel proved to be perfect guests – they had a little relaxation time before we hit the locks and they were a willing and efficient crew. 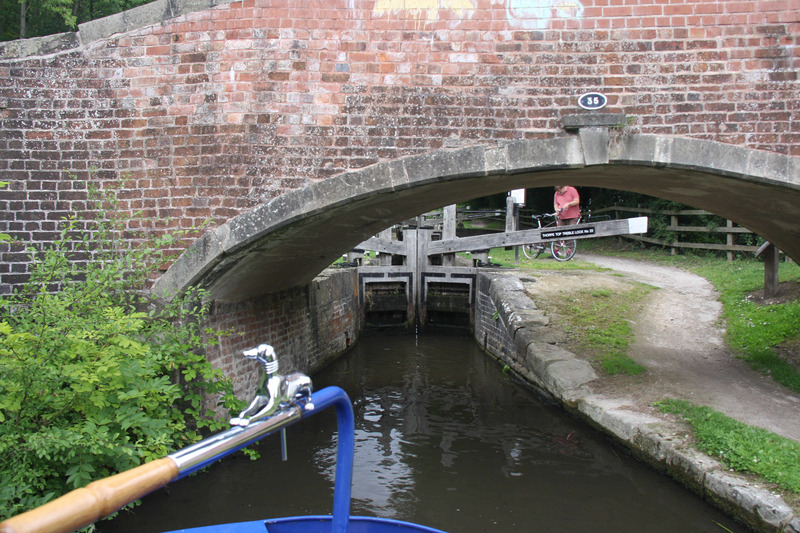 I was on the helm and the locks seemed narrower on the way down than on the way up! The first few were set against us, as predicted, but then we passed nb Futurest coming up so we had the next few were set our way. The crew of nb Futurest (which may have been a regular skipper and guest crew) were a genial lot and kindly helped re-set the staircase for us which saved Richard a climb over the gates. 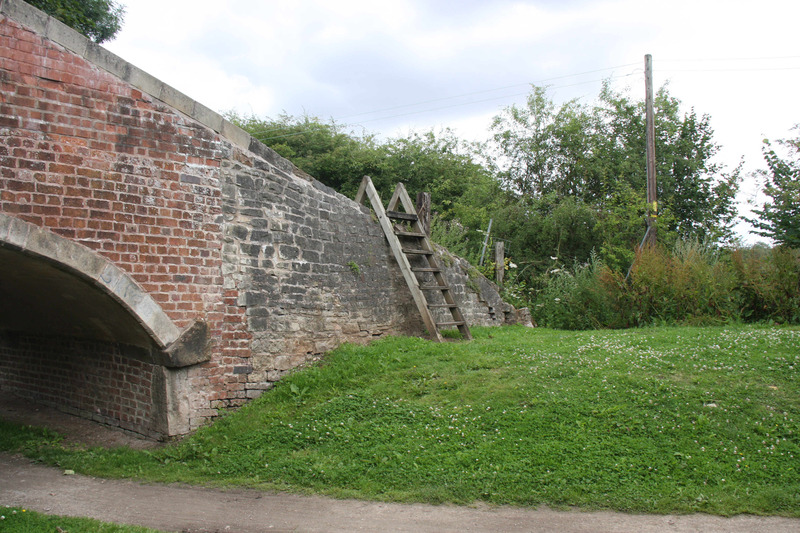 They known the area very well as they acted as historical advisers during the restoration and are authors of a guide to the canal – useful stuff (and left a comment on our last post). 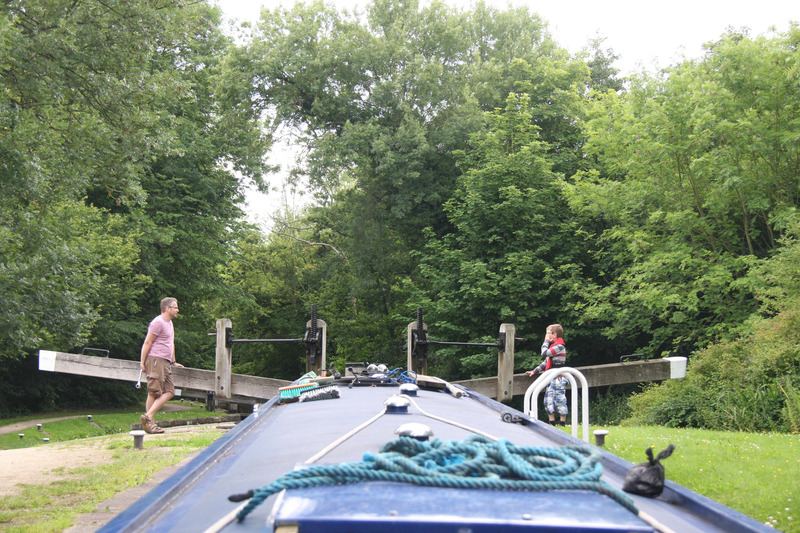 Our next boating encounter was less pleasant – we were coming down a lock with the next one set our way when the upcoming boat (who shall be nameless) turned it right in front of us, despite our shouting down that we were about to come out of the lock above. 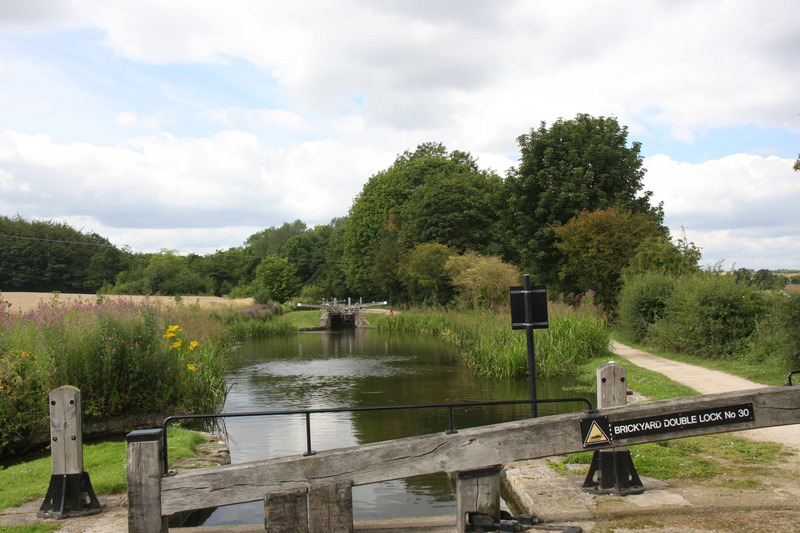 We had to wait for them to empty the lock and come up; I moved forward into the pound past a clump of weed to where the canal was a little wider for passing; they dithered over coming out, leaving me to be pulled into the shallows by the bywash. As they passed they scowled mightily. 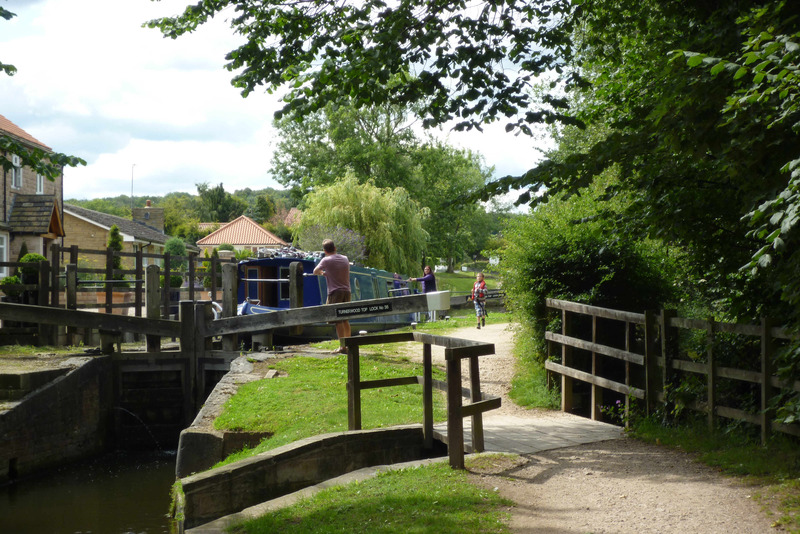 Now, apart from being a criminal waste of water, turning a lock is not really a big deal – after all, we’d have a lock set our way whatever – but it’s the attitude that leads to a lock being turned that so annoys me. The crew of the upcoming boat did not seem to realise that they were following nb Futurest up the flight and that’s why the locks were set against them! I was feeling a little hard done by when it suddenly dawned that we’d seen two boats on the move, three if you count our overnight neighbour. That’s more than we saw in three days the previous weekend. 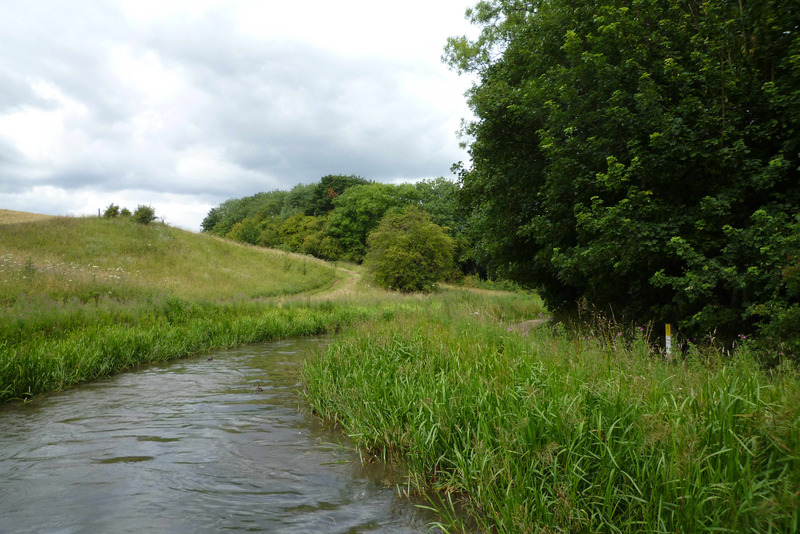 It was encouraging – this is a fantastic bit of canal and the Chesterfield Canal Trust have excelled themselves in getting this canal restored – it deserves to be used. 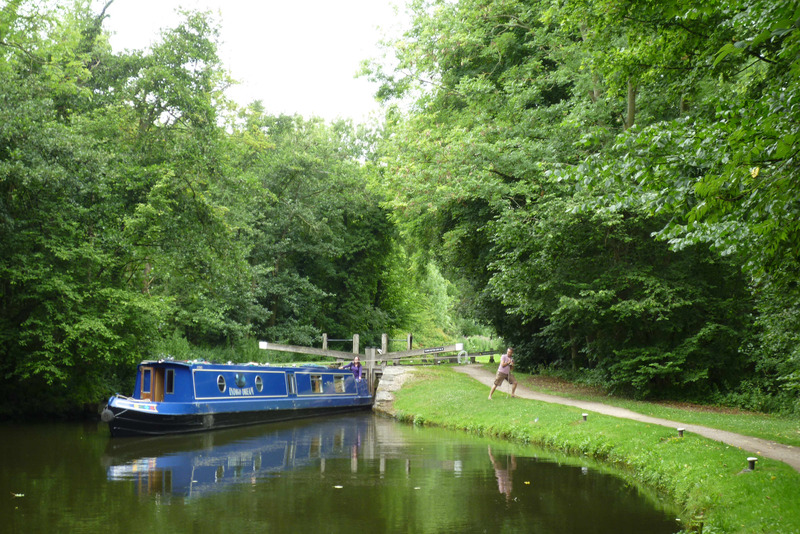 We stopped for a late lunch at the 2-hour moorings in Turnerwood – it’s such a pleasant spot it would seem rude not to! By now Daniel was feeling confident to ask the multitude of questions that he had about the characteristics and care of greyhounds. He’s a clever child and I suspect that he’s building up his facts for his business proposal – “Why we should have a retired greyhound”. There is Dragon’s Den and there is persuading your parents to let you have a dog – good luck Daniel! It was a lovely day – sunny and dry but not too hot – not that you’d get overheated in the mainly dappled shade along the flight. 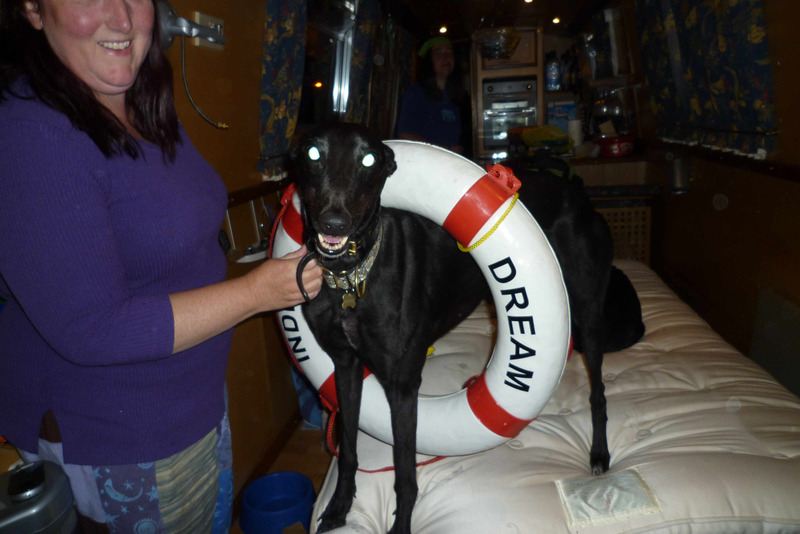 I was pleased because I so wanted Daniel’s first encounter with boats and greyhounds to be positive. He certainly worked hard at the locks – at one time I though he’d gone flying as he ran between them, but he was turning cartwheels – for fun!! Teaching Archie the diver how to use essential safety equipment! All too soon we reached Shireoaks – as we tied the boat up to let Matthew and Daniel off, we got a text from Sarah to say that she’d just arrived at the marina – what superb timing! 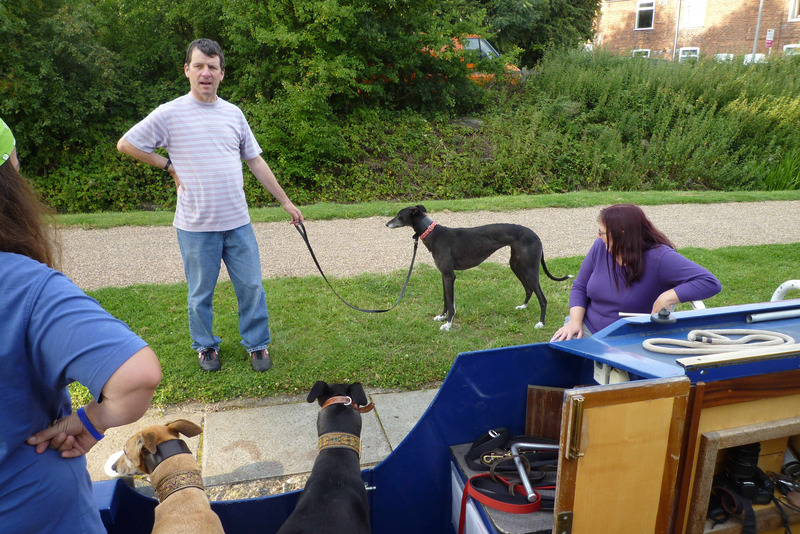 It meant that Daniel could end his cruising day by meeting another four greyhounds – he was very taken with Archie, who is the cuddliest hound. I’ve heard since that he was very keen to take Lynx and Archie home with him (not that he doesn’t like Lou but he was very careful not to aggravate her pains whereas Lynx and Archie could just be cuddled to jelly – which they enjoyed!)! We said goodbye to Matthew and Daniel here and loaded our next crew – Sarah and the hounds, who’d be staying overnight and joining us for a full day’s cruise on the Sunday. 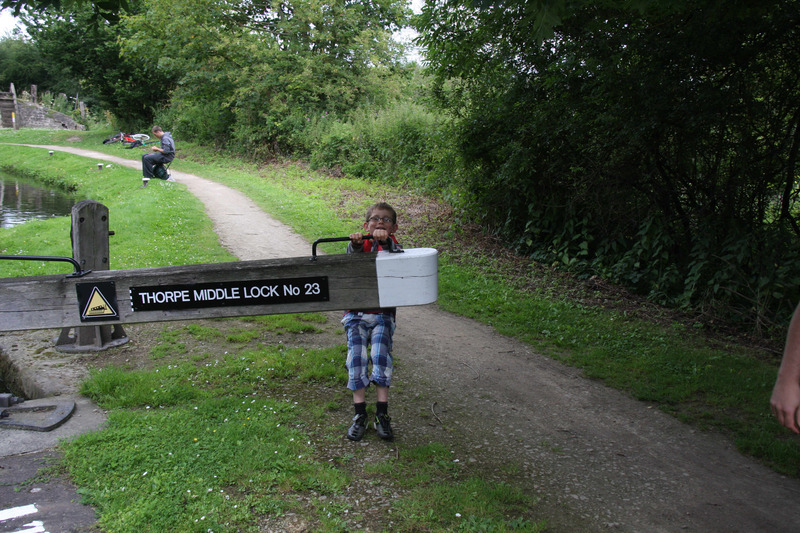 It was only 5pm-ish so there was a big decision to be made – stay at the marina or move on towards, but not into, Worksop? We worked our way down the three Shireoaks Lock, then through Doefield Dun lock before we decided that was close enough to town – we started to look for moorings above Deep lock, and although there was a line of rings a little way up, we moved a little further down the canal and banged a few pins into the towpath. 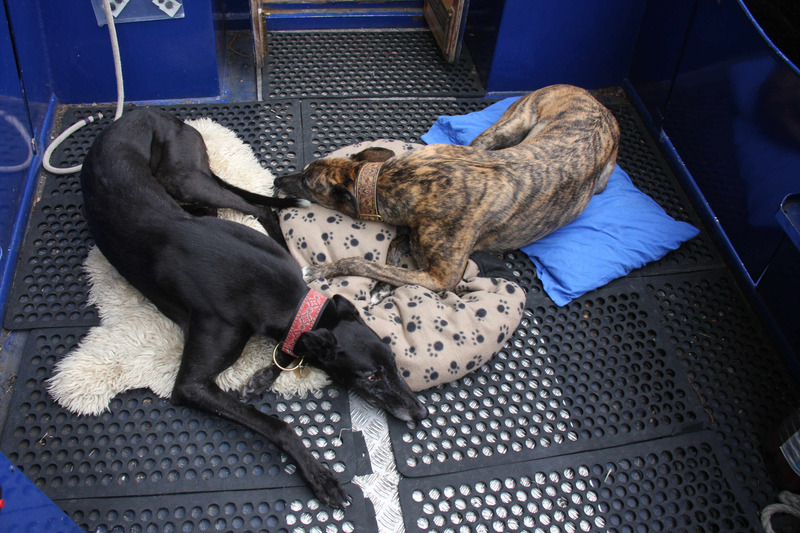 We only had a modest six greyhounds on board this evening – Lou and Lynx, of course, and Ranger (my favourite! 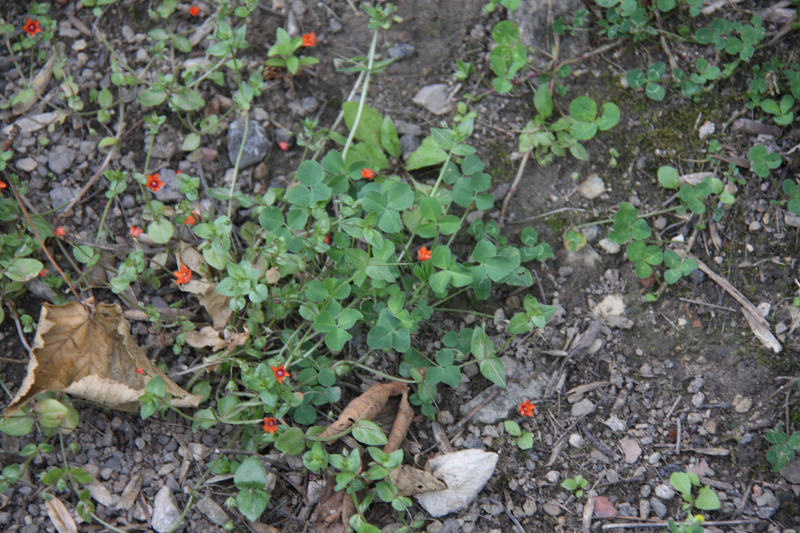 ), Miffy, Henry and Archie – enough to catch the interest of a passing walker with a greyhound. He had a dainty black girl called Heidi and said he had a big lazy boy called Alfie at home (Alfie couldn’t be naffed to come for a walk). We exchanged racing names and Sara avidly looked up whether they were related to our extended packs – by coincidence, Alfie is our old boy Blue’s half-brother – small world. The chap (only got the dogs’ names of course!) later brought a reluctant Alfie out to meet us – I was a both disappointed and relieved that he didn’t resemble Blue (a lot of his half-siblings are almost identical). Apart from Lou asserting herself loudly and impolitely, the rest of the pack got on a treat with their new friends though Alfie, being idle, soon lost interest and was pulling at his lead in the direction of home. We’ve finally found a contender to take Sid on in the “laziest hound” olympic event! So, Sarah, where are you going to sleep?? b) us doubled over with laughter at said dogs…. We put the sofa down into a double bed and put the guest mattress onto it – this attracted hounds like flies to fly-paper. I abandoned attempts to get them all off and tried to work around them. In the end I threw the sheet over Henry – the most ridiculous tussle ensued as he wrestled with the sheet then finally gave up, leaving us with a greyhound-shaped blob swathed in blue cotton. We decided to rescue him – he was quite indignant about it, but we finally moved him onto the top of the sheet so that we could quickly fit the rest. The pillows were soon appropriated by hounds and although it was very hot on board, Archie refused to move from under the quilt, which we’d thrown over him in an attempt to finish the bedmaking. Eventually we got the dogs on top of the quilt – Lou took her place on the bed with dignity – it is hers after all; interlopers Henry and Archie joined her, leaving a tiny corner for Sarah. In the meantime, Ranger had sensibly snaffled the foam bed right at the end of the boat, out of the way of the melee, and Lynx had curled up on Ty’s day bed – also out of the way – Miffy cuddled up to him – his dream had finally come true! As it happened, Lynx and Ranger were the only two dogs to stay put all night – the rest played some obscure game of musical beds (another potential olympic sport), accompanied mainly by Lou’s complaints. Archie joined us on our bed and proved to be an expert human manipulator. At one time I woke up, perched precariously on the very edge of the mattress – Archie had all four feet planted firmly on my bum and was pushing me out. Archie’s back was braced against Richard, who was being subjected to the pressures normally experienced in the heart of black holes as he was steadily crushed against the gunwhales. This is why we don’t encourage our hounds to sleep with us! Ah well, they do say a change is as good as a rest – maybe that should apply to laughter as well….. 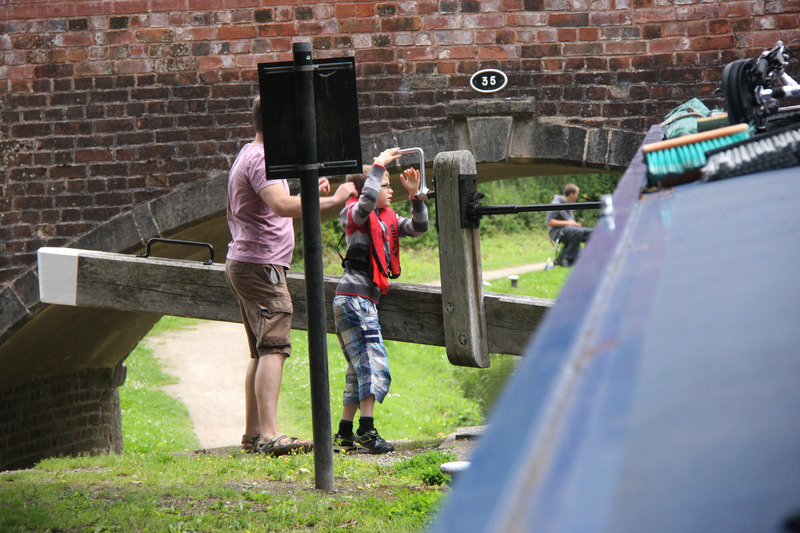 Weight training - canal style - Matthew tugging Indigo Dream onto a better line (I blame the bywash! )..